As I am getting prepared for next year, I am busily working over here. This year I have decided to make as many of the cards I have used from elsewhere that my schedule will allow for. One of the first presentations I give is about the sand and water globe. 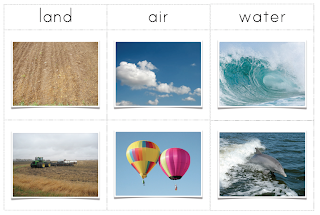 Following that presentation, I then present the Water, Land, and Air cards. This is the Control Chart for the Land Water & Air Cards. With this Control Chart children can do this work on their own and have a control of error to see if they are putting the cards in the right group. For photos of the Sand and Water Globe and Land Water and Air Presentations with information that I really like you can look here. 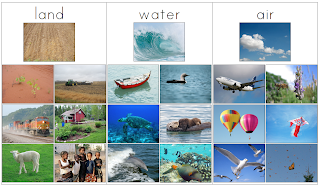 I have also found a FABULOUS post at tothelesson.blogspot.com about Language Rocks that connect prewriting with these first geography lessons in an absolutely wonderful way! Thank you so much for given free printables. I am a Montessori teacher that works in a traditional PrK but I have my classroom as a Montessori classroom and the Director is understand the method and she loves it.